When I started planning this week away I was planning on doing a game every day. But then realising I would have a lot of spare time to fill. And there would only be a limited amount of stuff that I could do. I had Monday and Tuesday daytime to fill. So I started scouring websites, looking for reserve games. 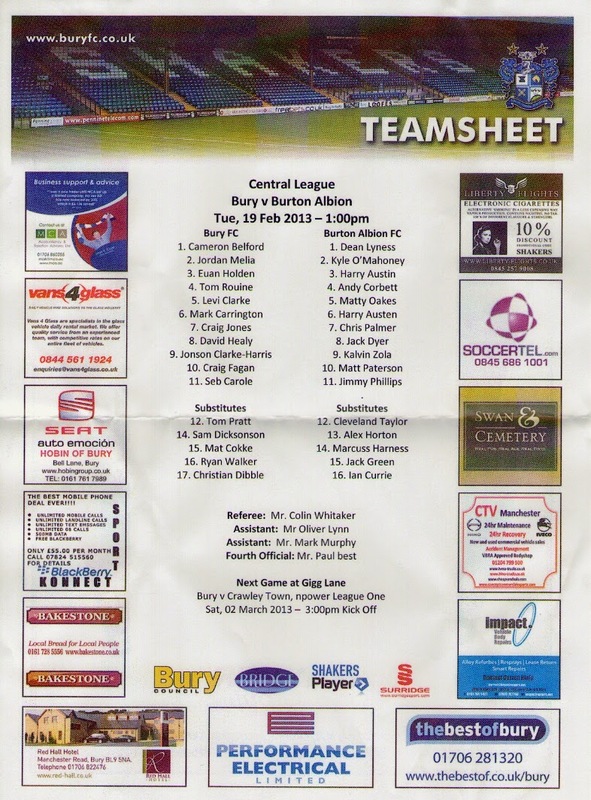 I found that Bury Reserves were at home to Burton Albion Reserves. And to make things even better, it would be played at Radcliffe Borough's Stainton Park ground, where I had not yet seen a game. I woke up around 8 on the day, having a bath, writing my blog and relaxing until around 11.30. I was staying at Widnes Travelodge, in fact, I was staying at Travelodge hotels all week and this one was probably the nicest in terms of the room. I then drove to Radcliffe, just outside Bury, arriving at 12.30. I paid £4 to get in which was more than usual for a reserve game, but it would turn out to be good value, being one of the best games of my time away. For my money, I also got a teamsheet and free biscuits at half time! As for the game, Bury looked to have named the strongest lineup. Most notably David Healy the Northern Irish international forward but also Cameron Belford and Craig Fagan whose names I recognised. For Burton, I recognised former Wycombe player Chris Palmer and giant centre forward Calvin Zola. And it was Zola who looked the best player on the pitch in my mind, easily winning all his aerial battles and showing good strength. We don't really have anyone in this mould at Wycombe so he could prove a useful signing if ever he came available. Matt Patterson opened the scoring for Burton with a tidy finish after around 10 minutes. And they never looked back really. Zola got the goal he deserved with a tap in after Belford parried the initial shot. Jimmy Phillips got the goal of the game from a long range shot as Burton cruised, Cleveland Taylor also getting a couple after coming off the bench. For Bury, their replies came after Burton keeper Dean Lyness made a hash of handling a cross and through a last minute penalty that looked as if it had been saved initially. Burton running out 5-2 victors and looking a cut above Bury. After the game, I went and checked into my hotel on the M62, mainly so I didn't have to leave my camera and iPad in the boot of my car. I only stopped for 5 minutes as I wanted to get into Burnley nice and early. STAINTON PARK is a pretty average non-league ground, probably capable of hosting football up to the Conference North at present. Unusually the main stand is behind one goal, holding around 350 and being covered. The rest is mainly uncovered terracing, though there is more cover on the clubhouse side, holding around another 300. Talking of the clubhouse, I went in there and it is really smart, there are loads of sports items and articles about comedian Bernard Manning, who was their former Chairman. The club shop and tea bar were not open on my visit, so I can't comment on these.